The U.S. stock market has started the year with a 6% decline in just the first 6 trading days. In Canada the the S&P/TSX Composite index has technically entered into a bear market, which means it has fallen more than 20% from its peak. If that doesn’t concern investors then some recent comments from the global strategist at Societe Generale might do the trick instead. The latest bearish comments on what’s in store for the global economy came from, Albert Edwards, who is notoriously known for being a permanent bear on stocks. He suggests that the falling Chinese currency will trigger a wave of global deflation and send the United States into a downward frenzy and cause the next global recession. Edwards is not alone. Economists at the Royal Bank of Scotland recently warned of a “cataclysmic year,” where the stock markets could decline by 20% as the price of oil falls to a multi-decade low of $16 per barrel. The bank said, “sell everything except high quality bonds. This is about return of capital, not return on capital. In a crowded hall, exit doors are small.” RBS noted that the current financial climate is similar to that in 2008, comparing China to the investment bank Lehman Brothers as the catalyst which will eventually lead to the next global financial crisis. But Edwards is predicting a much worse outcome where the S&P500 stock market index will fall by over 50% and drop all the way down to the 700 points range. Many analysts believe that another part of our current situation is an indirect result of the excess money printing done by the Federal Reserve in an effort to stabilize the economy after the 2008 financial crisis. But instead of stimulating the economy in a healthy way, the quantitative easing programs have only served to inflate the price of global financial assets such as stocks, bonds, and real estate, to record highs. It was unsustainable from the beginning and now we are seeing the fallout with lower commodity prices, a slowing global economy, and falling stock markets around the world. From a directional analysis the bearish economists and analysts are probably right. But the specific things that they talk about are at the tail risk of the probability curve. This means that it’s possible for the S&P500 to slide down below the 700 mark, but that would be a worst case scenario. 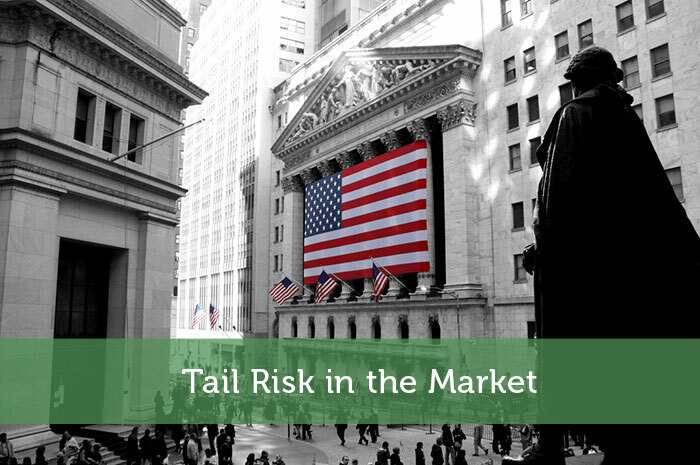 The term tail risk comes from the thin tail portion of a bell curve of potential outcomes which is used to determine how likely certain events will unfold. These small, but not insignificant risks have to be mitigated or dealt with as they appear. The chances of these pessimistic events unfolding are still very unlikely. Conditions in the markets would have to deteriorate even more from here for a $16 per barrel oil situation to play out. It’s true that stocks are overvalued right now based on the Shiller P/E ratio. But markets move in cycles so this is to be expected over time. The Shiller P/E ratio is a cyclically adjusted price-to-earnings ratio which measures the valuation of the US S&P 500 equity market. It is defined as price divided by the average of ten years of earnings (moving average), adjusted for inflation. Named after the Nobel Prize Laureate Robert Shiller, this ratio was created to be a more comprehensive alternative to the regular price-to-earnings ratio because instead of looking at the current year’s earnings, the Shiller P/E ratio uses 10 years of average earnings as a baseline which looks at the stock from the perspective of an entire business cycle. So what should you take away from these bearish sentiments? The answer depends on your long term financial plan. In the long run time in the markets will beat any attempts at timing the markets so if your risk tolerance is relatively high and you have a long term investment horizon then selling everything right now may not be the best move to make.